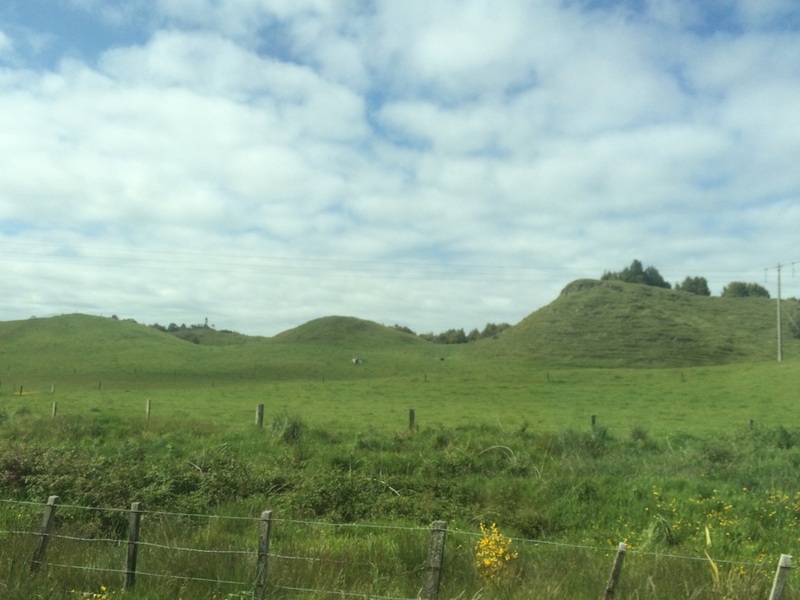 Week 2 was our half and half week in New Zealand – half in the North Island, half in the South. 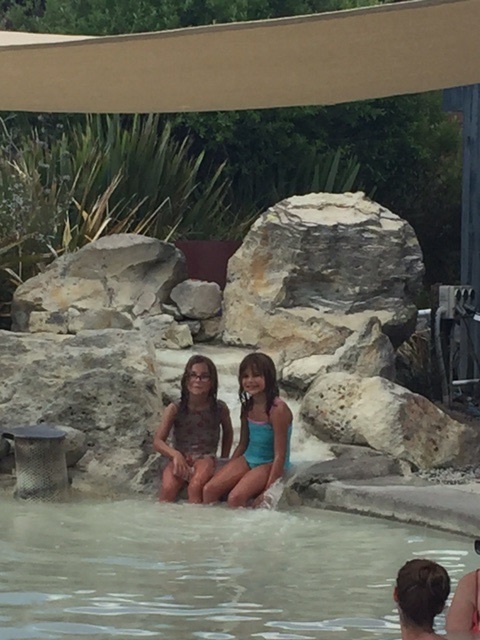 We spent our last day in Rotorua enjoying the playgrounds; and the mud baths and sulfur pools in Hell’s Gate. It turns out that Hell’s Gate is quite the geothermal area, which in retrospect, we should have spent more time exploring. I didn’t enjoy the sulfur pools because it was too hot that day to be sitting in a hot pool, and the smell of sulfur stayed with us for days. Taking a dip in the Sulphur pool. I really liked our time in Rotorua. I thought it was a nice size and it had a wide variety of things to do. The smell of sulphur was not constant, so didn’t bother me that much. New Zealand countryside driving from Rotorua to Matamata (where The Hobbiton is). 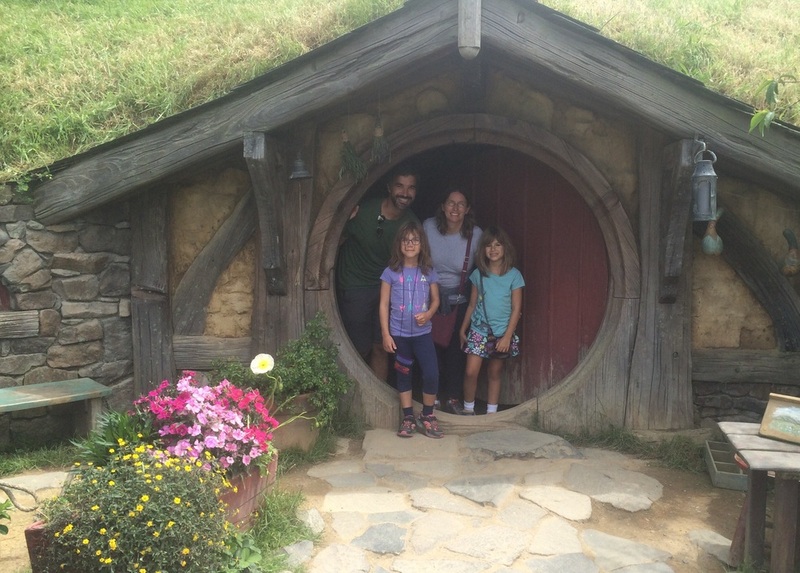 From Rotorua, we made our way to The Hobbiton, where part of The Hobbit films were made. I wasn’t sure what the girls and I would think of it, having not read the books or seen the movies. We all enjoyed the tour though, especially Hannah who wanted her picture taken in front of most of the doors. Amy a little less so, though she had a lot of fun at the party field. 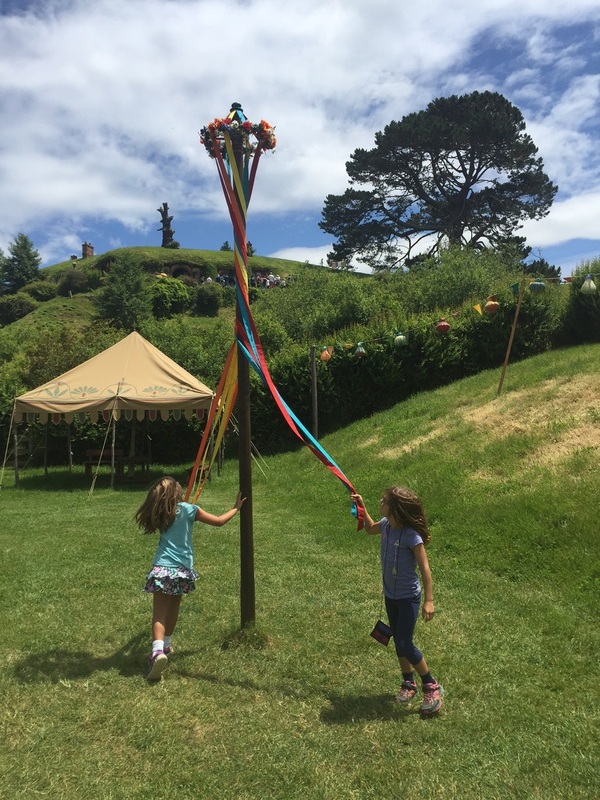 If you have a chance to visit The Hobbiton, I definitely recommend it. We then made our way back to Auckland, where we stayed in the home of a lovely retired teacher. She gave our girls some books and had breakfast ready for us the next morning. It was then off to the airport for a short domestic flight to Christchurch. Despite the warnings from my mom, we didn’t have any problems with JetStar, only with Amy’s meltdown in the departure lounge! 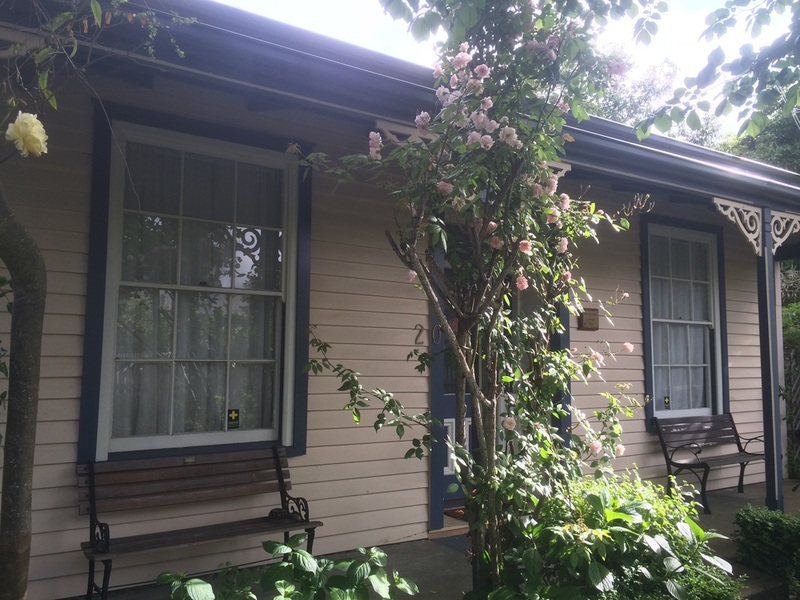 In Christchurch, the Airbnb was a small historic home. Anthony and I liked having a full house to stay in again as the ones in Auckland and Rotorua had just been the bottom level of a house. 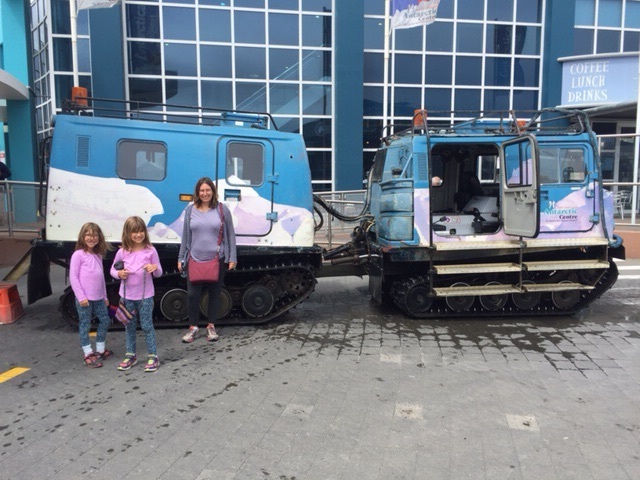 We had passed by The International Antarctic Center on our drive from the airport to the house and decided to check it out. It was a lot of fun, and I highly recommend it. Amy in particular wants to go back. 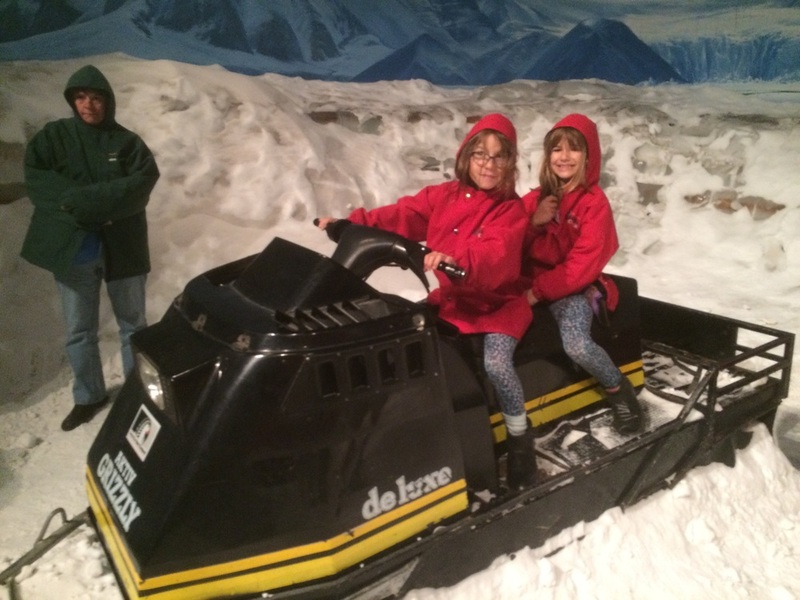 With 4D movies, a Hagglund ride (a course that simulates driving in Antarctica), and a simulated windstorm, what’s not to like! The Hagglund. It rivals any amusement park ride! Let’s go for a ride! The next day we visited the Willowbank Wildlife Reserve. I thought it was a bit run down, but they have a very good Kiwi conservation program. Hannah’s favorite part was feeding the eels. We all got a kick out of a Kea (a very intelligent Alpine parrot), trying to get into a gentleman’s picnic basket and our bag. The girls also got a goodie bag from a company having it’s Christmas party there! I’ve heard of feeding goats, but not eels! 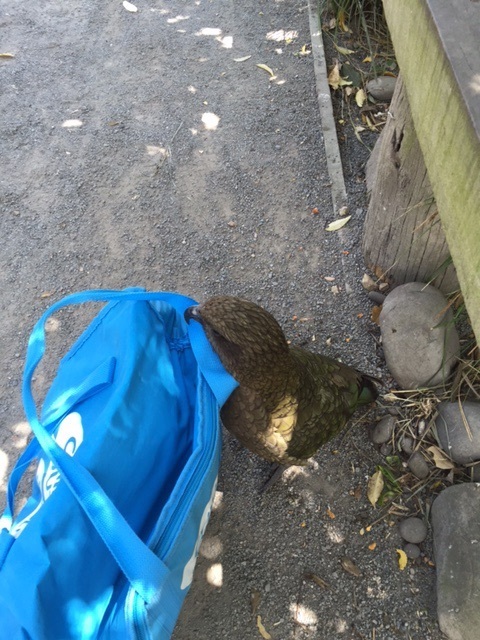 The Kea trying to get into our food bag. Next it was onto Aokari Mount Cook. Aokari is the Maori name for the mountain. It was about a 4 hour drive from Christchurch. The central part of the South Island is mainly farmland, with the mountains visible in the background. Then you come upon these stunning aquamarine lakes that give Lake Louise (in Alberta, Canada) a run for its money. 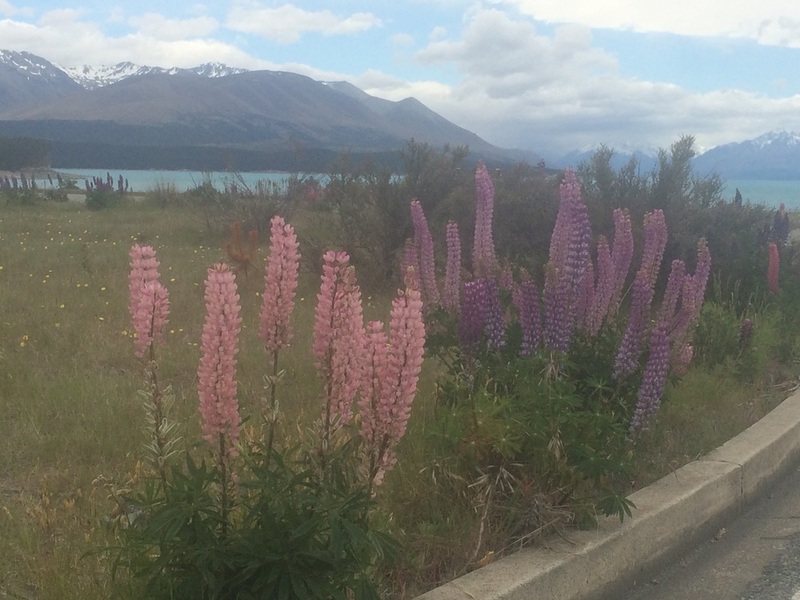 The wild lupins also add some colour to the scenery. 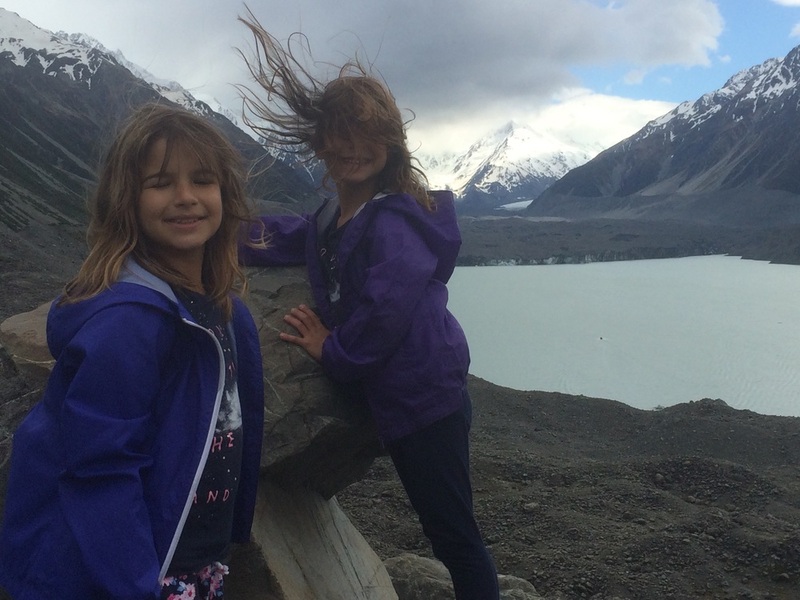 Lake Pukaki…just stunning! 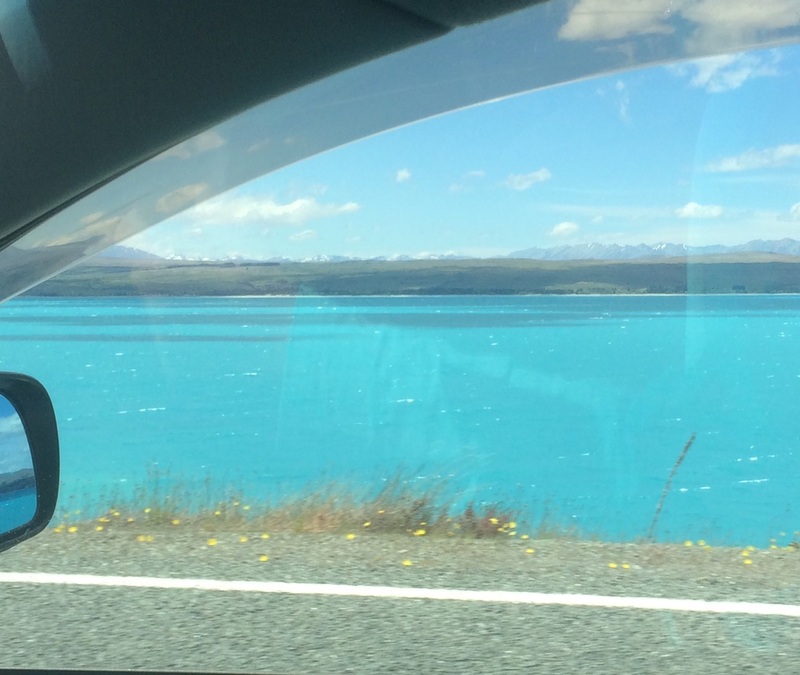 Lake Tekapo is a similar color. If you see the lupins, you’re getting close to a lake. 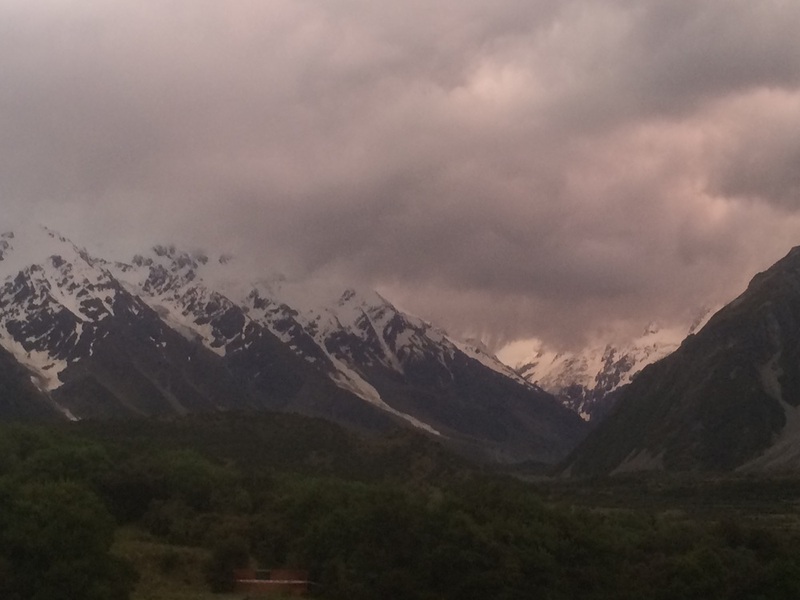 The Aoraki Mount Cook Village was not quite what I thought it would be. It’s in the National Park and is very tiny. For some reason, I thought we’d be higher up in altitude. 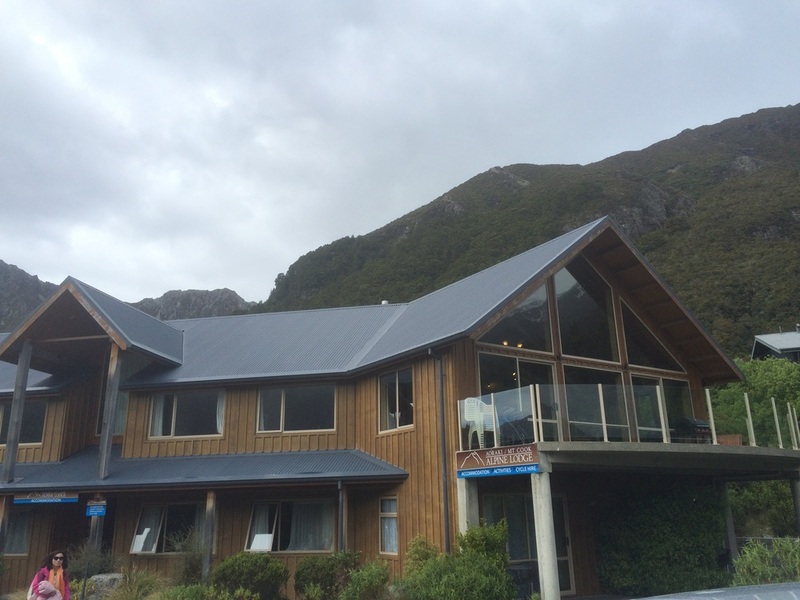 The lodge we stayed in had a beautiful lounge/kitchen area with spectacular views (even if they view was fog filled!). 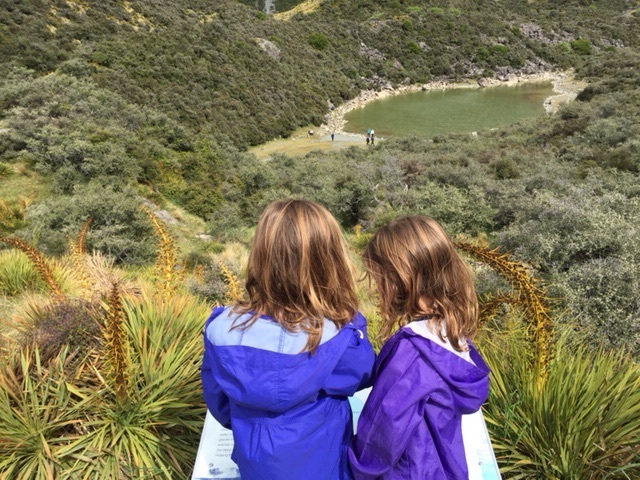 Although we didn’t get out star gazing, we did enjoy the planetarium shows, as well as a 3D movie and a regular screen movie, the latter about Primeval New Zealand. 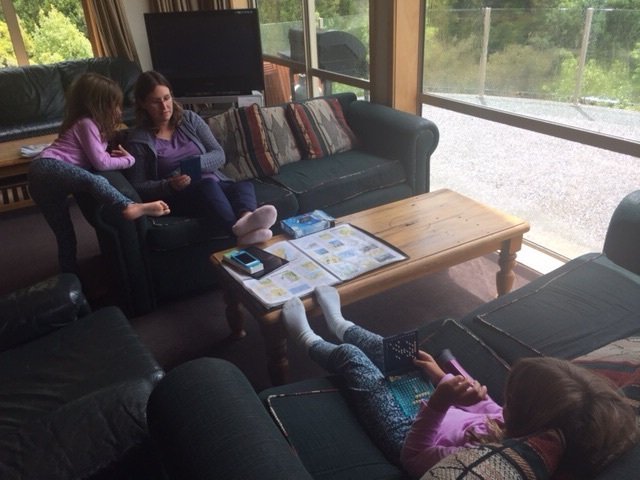 We also enjoyed several games of Monopoly (the NZ version) and a couple of games of Battleship! Totally reminded me of my childhood! I’m going to sink your ships! On our way back to Christchurch, we stopped and hiked up to a viewpoint of the Tasman Glacier and Blue Lakes. What a disappointment as the lakes are no longer blue, and the glacier is barely there (thanks to global warming). We still had some beautiful views though. Believe it or not, that’s the Tasman Glacier at the end of the lake…not pristine white! Reading about why the Blue Lake isn’t blue anymore (it’s no longer fed by glacier water, just rain water. The green is the algae). Hope you enjoy these pics from New Zealand. We spend our last week in the South Island before heading to Malaysia. What beautiful pictures. You have certainly experienced unusual things. 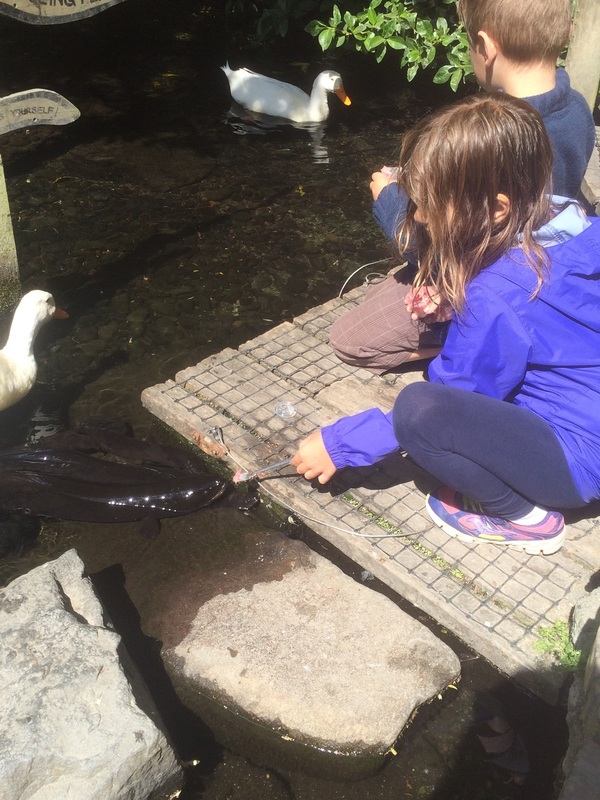 Feeding eels! !1The Hobbit House! !the interesting lakes!! !Riding a Snowmobile!! what was the temperature ?? Wow!!! !